As a boy, on holidays at my grandmother’s house there was a cherished hardback book I would pore over, losing myself for hours in pictures and stories of the Great Barrier Reef. I dreamt that one day I would get the chance to visit, to see firsthand the flora and fauna of the world’s largest single structure compiled of living organisms. 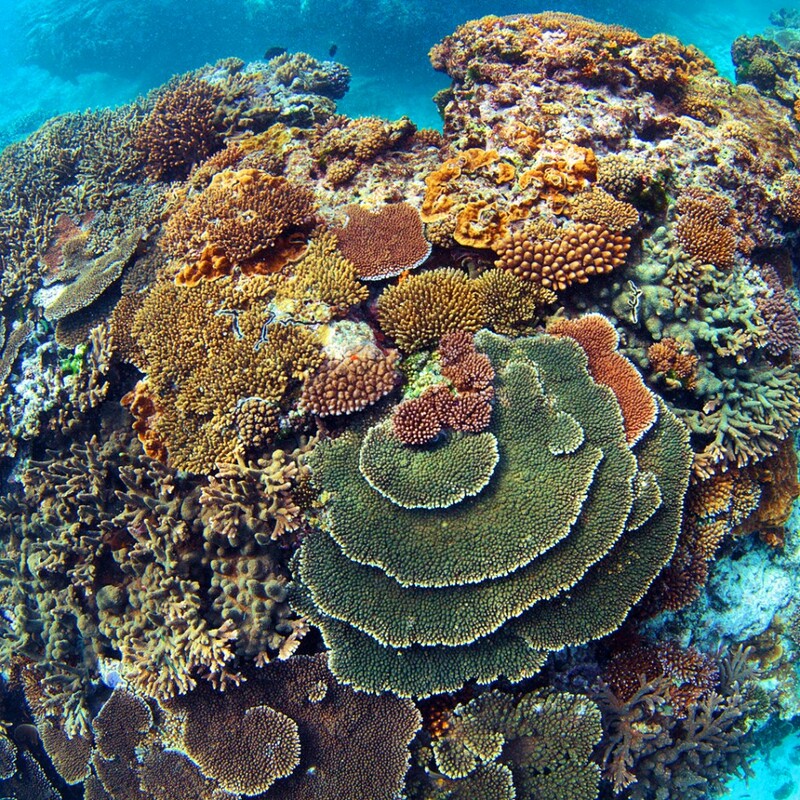 Although it is all linked, the GBR is actually made up of over 3,000 individual reef systems that together are larger than the Great Wall of China. Indeed, the GBR is the only living thing visible from space. It’s described as one of the seven wonders of the natural world. 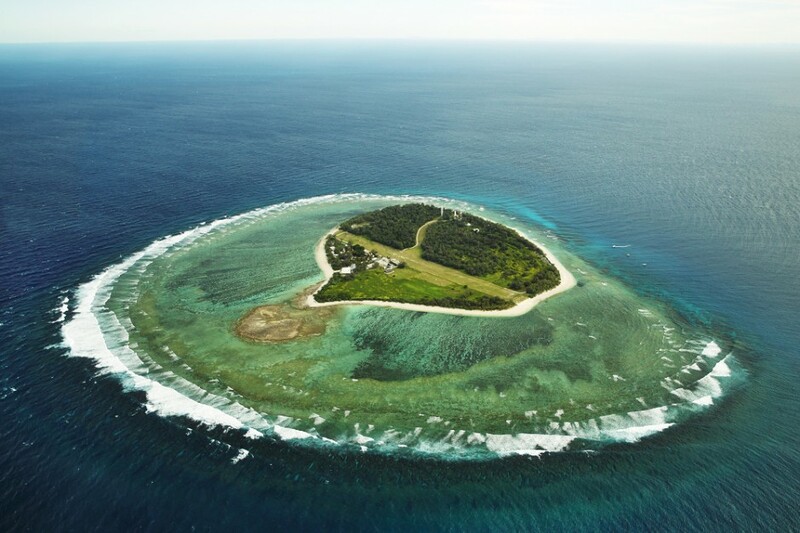 Recently, my long-held dream was realised at Lady Elliot Island, the southernmost cay on the reef, easily accessible from Brisbane or Bundaberg. Here’s some of what I saw. 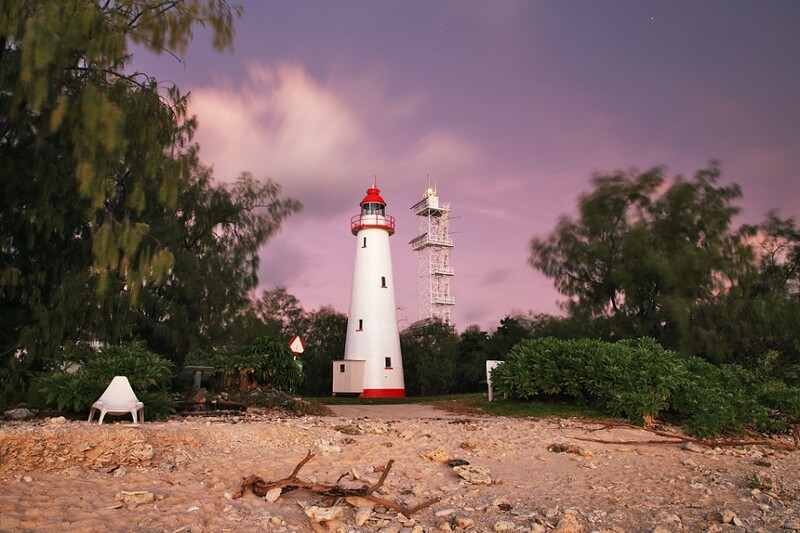 Al’s visit to Lady Elliot Island was sponsored by Tourism and Events Queensland. 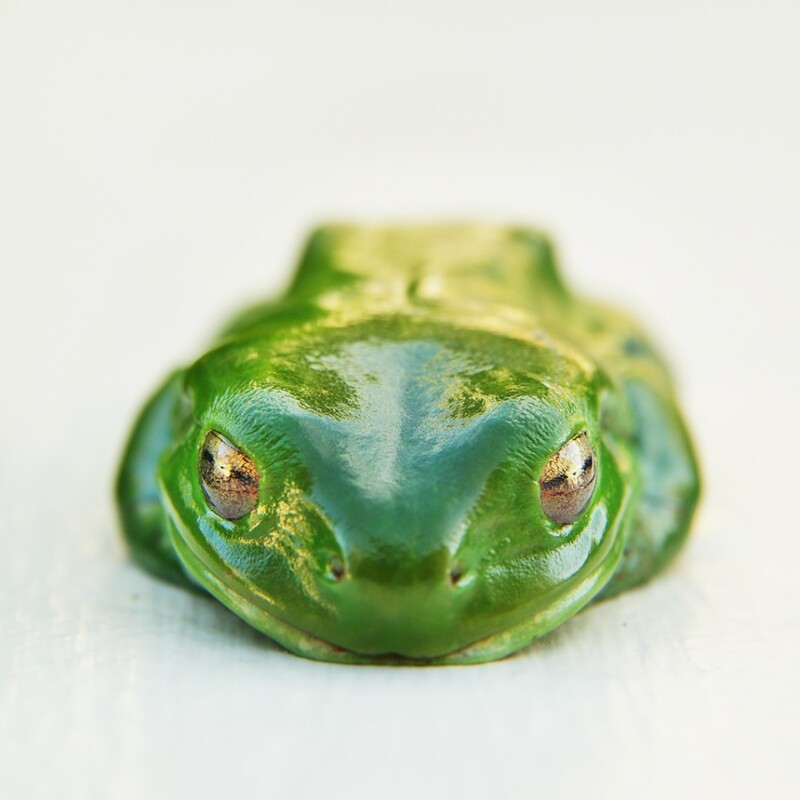 Learn more about Queensland on their blog. On approach and departure, the pilot will circle a couple of times in each direction, so irrespective of which side of the aircraft you sit on, you'll be able to get a picture without someone’s head or seatback in the way. 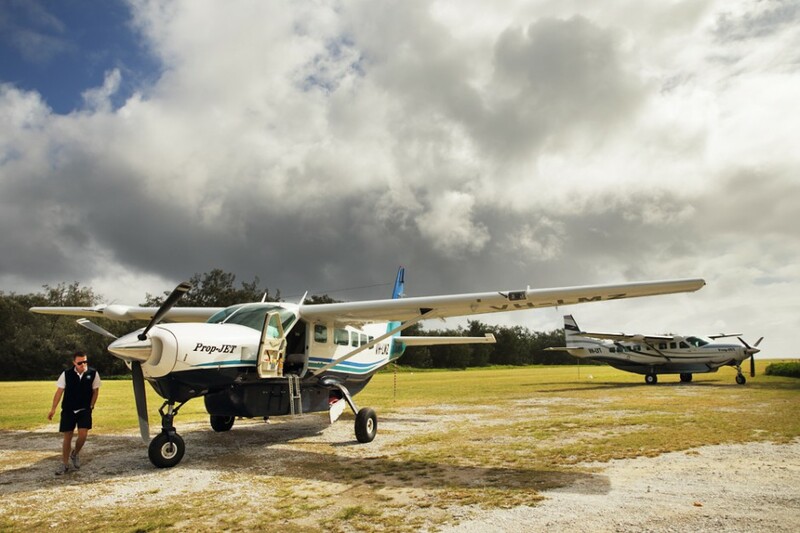 All the staff at Lady Elliot Island excel in their respective fields and are without exception a friendly bunch. The welcome begins as soon as you board the flight from the mainland, as I discovered when I was given the opportunity to sit up front next to the pilot. Matt told me an interesting story about how, before he landed the Lady Elliot job, he'd been working out of a town called Kununurra in the far north of Western Australia, close to the border with the Northern Territory. Traditionally, as the expression suggests, Aboriginals would "go walkabout" on foot, but over time modern-day conveniences have worked their way into their culture, as they have everyone's. For instance, the trans-bush journeys to catch up with family and friends have become government-subsidised flights. Essentially, "walkabout" would now more aptly be described as "flyabout." 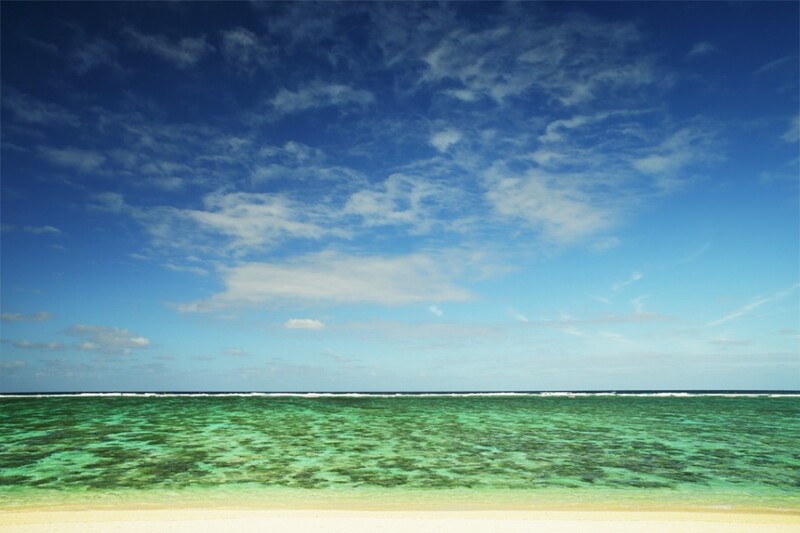 The Lady Elliot Island is surrounded by course coral sand. This is the view from the beach on the east side, just a few yards from the guest accommodations. 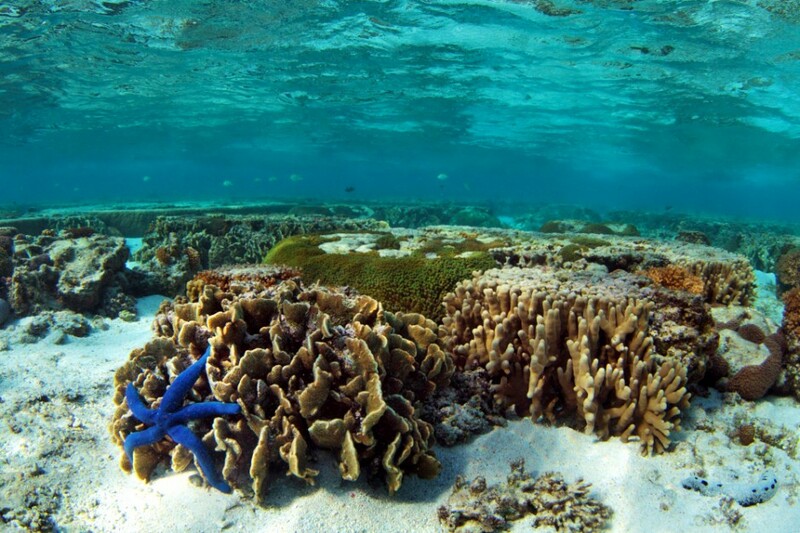 At low tide the coral heads jut above the water, and at high tide the lagoon fills, covering the reef entirely, and there's the most incredible snorkelling to be had in just a few feet of water. 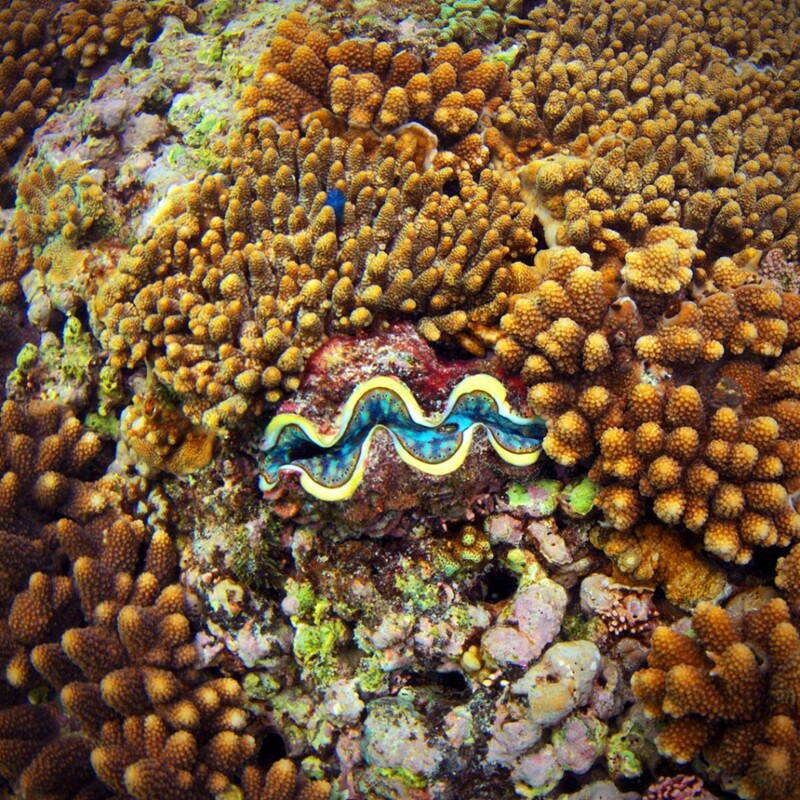 The reef is littered with giant clams, and the brilliant zigzags of the mantle, none the same colour, are impossible to miss. Giant clams are symbiotic, their mantle tissue providing a home for single-celled dinoflagellate algae, which are the bivalve’s source of nutrition. During daylight hours the clam exposes its mantle to ensure the algae photosynthesize. The clams are quite wary and tend to retract their mantles and close as snorkelers approach, so a picture with fully exposed mantle can take a little patience. Giant clams can grow up to a staggering four feet across and weigh over 500 pounds -- there are even stories of people being trapped in them! The blue thing above the clam is a Christmas tree worm, yet another of my favourite reef inhabitants. I was put in Reef 10, a room on the end of a block of three and closest to the beach. 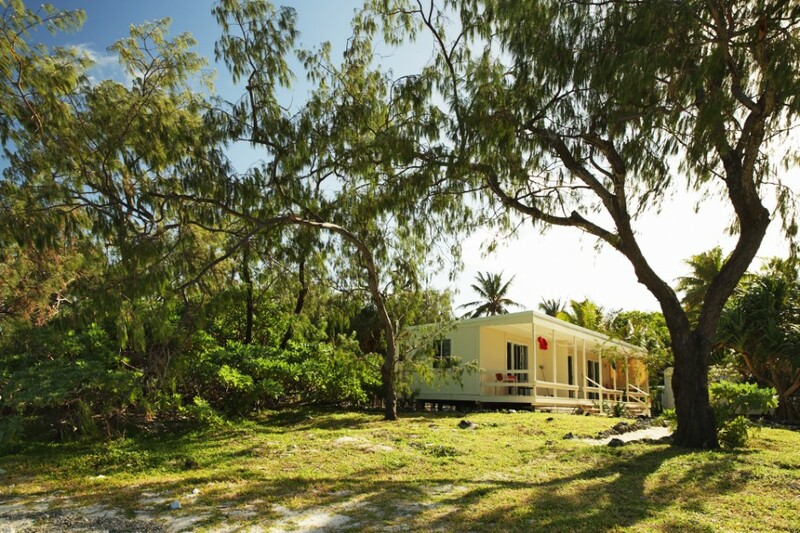 There are a variety of room sizes and locations available to suit different budgets, from two-bedroom Island Suites to the more basic Eco Huts. There are no locks on the doors, which just adds to the pleasant vibe on the island. Some of the prices might appear high, and if the accommodation is a little steep for your budget, you can always take a day trip instead. Having said that, I would recommend you give yourself at least one night on the island to really appreciate all that’s on offer. As mentioned, at high tide it's possible to snorkel right off the beach on the east side. Probably the highlight of the trip for me were the numerous 'friendly turtles' in the lagoon -- guests are permitted to scratch them to clean the algae off their shells. 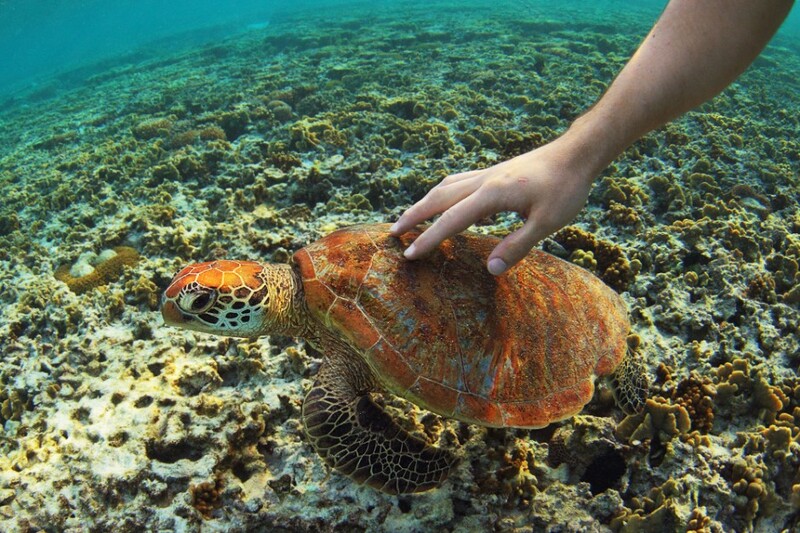 Not all are keen on close contact; some will swim away (and shouldn't be chased), whilst others, like this one here, seem to actually approach snorkelers expecting the turtle version of a manicure. There's something very powerful about being able to get so close to a wild animal -- that lack of fear is a beautiful thing and made quite an impact on me. One of the things I really liked about Lady Elliot was the level of trust they placed in people staying there; most eco hotels operating in protected areas are nothing like as relaxed. A sprinkling of humour is added at meal times by the cheeky buff-banded rails. Constant vigilance is necessary to avoid inadvertently sharing your lunch with them. I learnt pretty quickly that when getting food from the buffet, it’s important to get all you need in one go -- if you forget something and take another trip, leaving your food unattended, you can be sure a rail or two will be attending to it on your return. It’s amusing watching the uninitiated learn the hard way, though. Even on parts of the reef where exposure to wave action keeps live coral somewhat suppressed, there's always something to see. 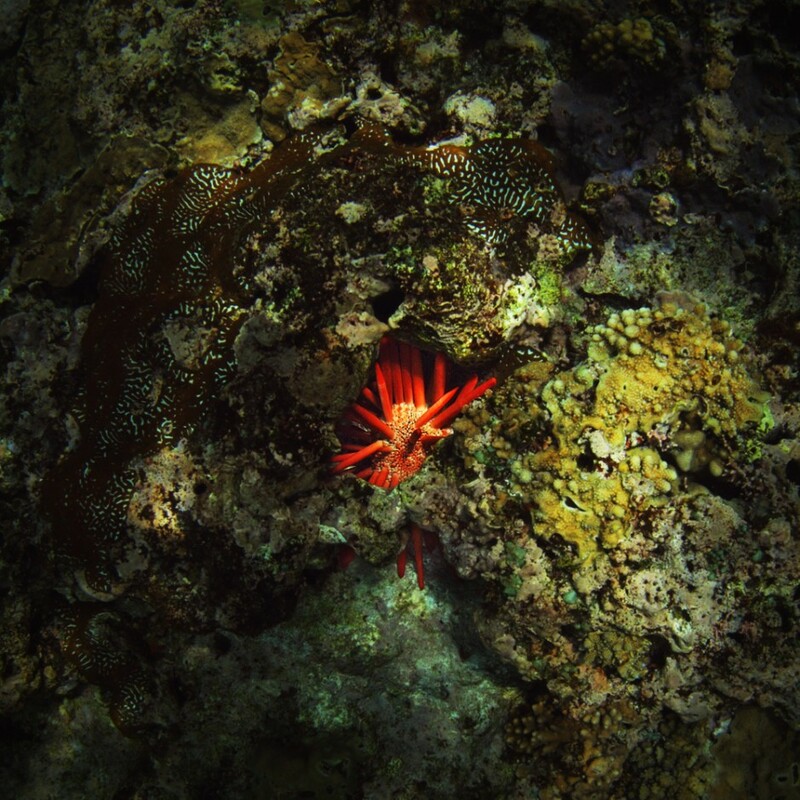 I stumbled across this urchin nestled in a nook in the reef, a serendipitous flash of colour in the mostly subdued surroundings. 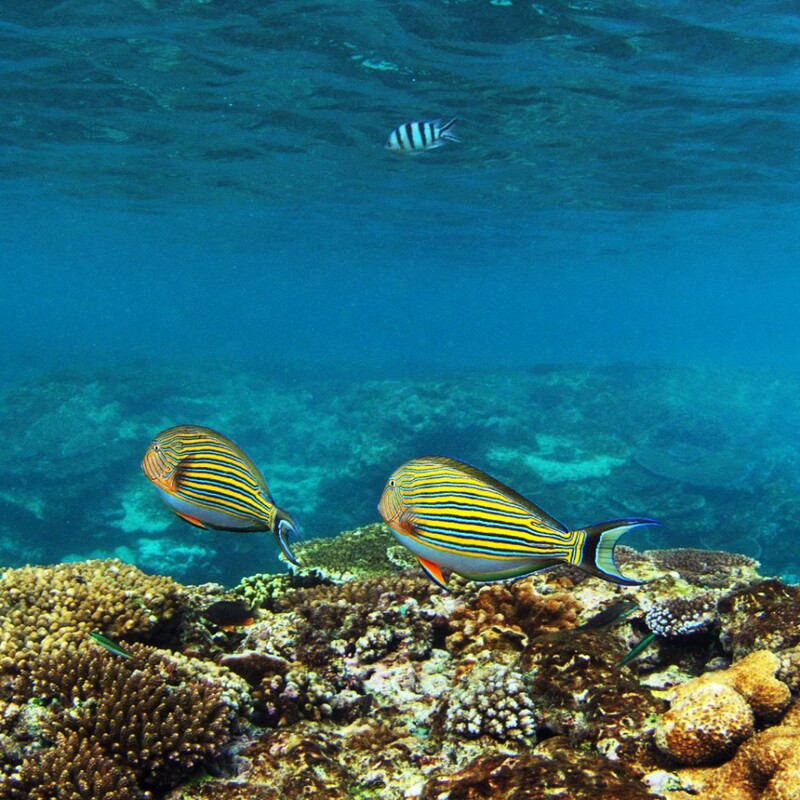 A pair of lined surgeonfish in their natty pinstripe suits, with a scissortail sergeant (zebra stripes) beyond. 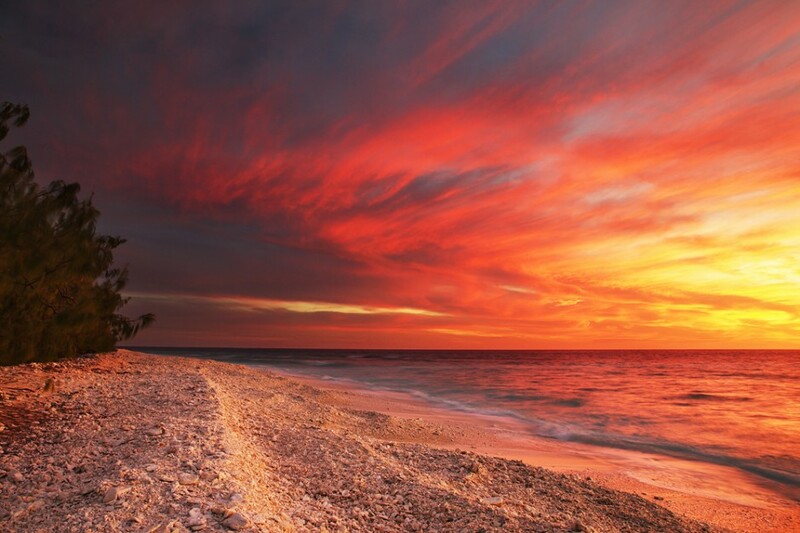 With the majority of Queensland’s coastline facing east, if you find yourself on the coast the chances are you’ll lose the sunset over land to the west. Not so on Lady Elliot, where guests can go to the beach in the evening and see the most beautiful sunsets over the Coral Sea, no other land in sight. 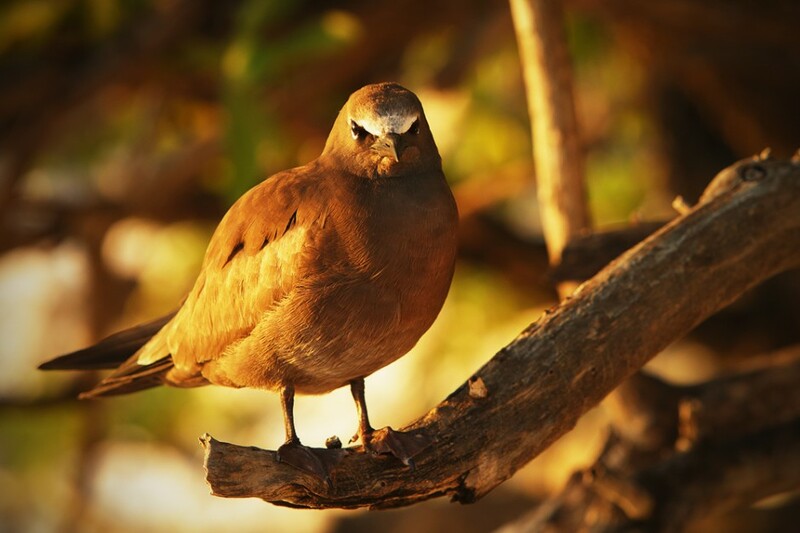 Also known as the brown noddy and a member of the tern family, this is the largest of the noddies. They can be seen alongside the smaller black noddies on Lady Elliot. Interestingly, they are rarely wary of predators and hunters, which earned them their proper name of Anous stolidus -- anous is Greek for "oblivious," and stolidus Latin for "unresponsive." Historically, sailors were able to 'hunt' them simply by picking them up. 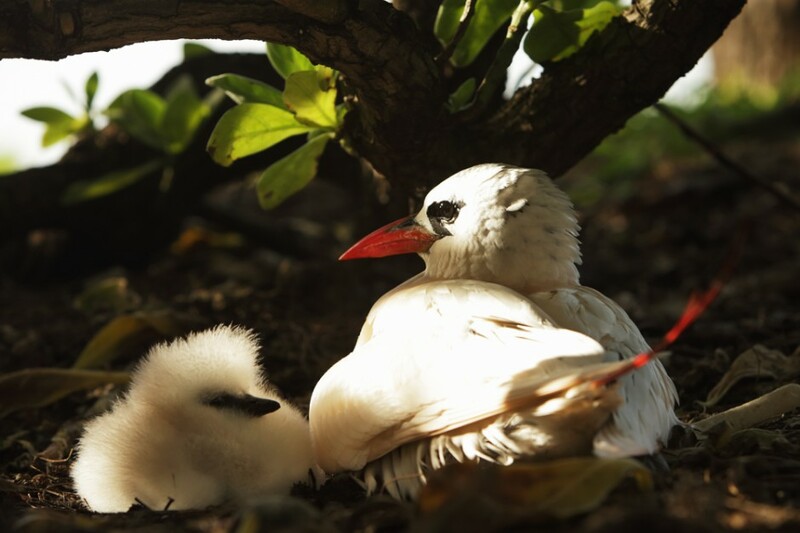 Lady Elliot has the highest seabird diversity of any island on the Great Barrier Reef, and each evening the noddies flock en masse just off the coast. The sight is impressive, to say the least, but apparently nothing compares to the summer months, when over 100,000 birds nest on the island. Staff told me some trees become more bird than foliage. The density of fish on the west side of the island has to be seen to be believed. The most visible of those are the several varieties of neon, multicoloured parrotfish that cruise amongst the coral heads just offshore. 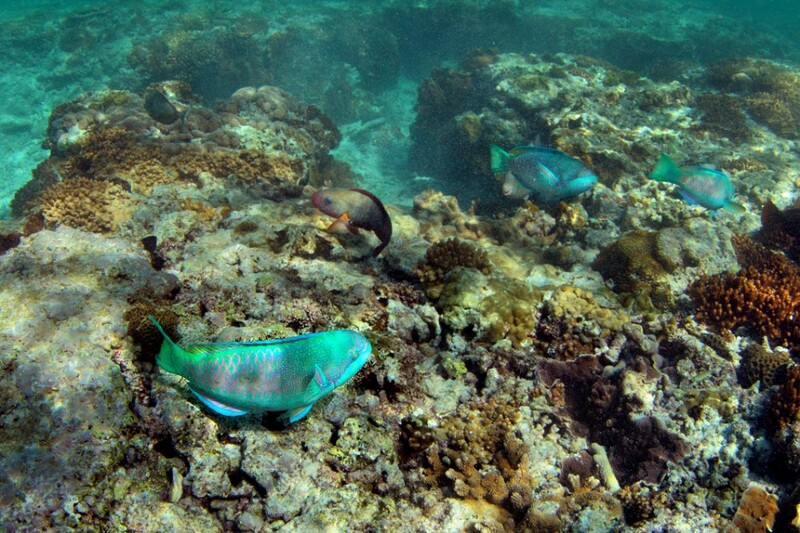 I think these are globehead parrotfish. 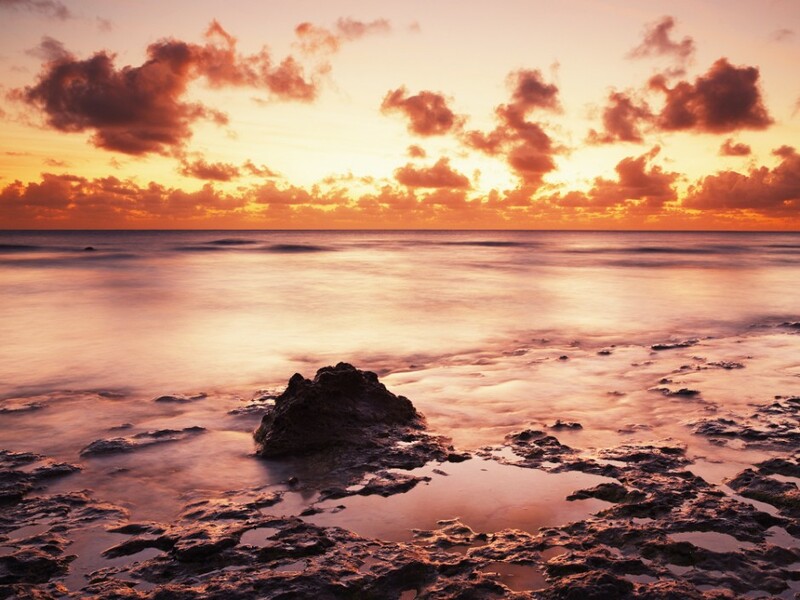 The geological history of Lady Elliot stretches back to the formation of a coral rubble spit around 1500 BC, although it took a further 3,000 years to develop into the coral cay familiar to visitors today. The island is now mostly formed of a curious blend of bird droppings and beach sediment. 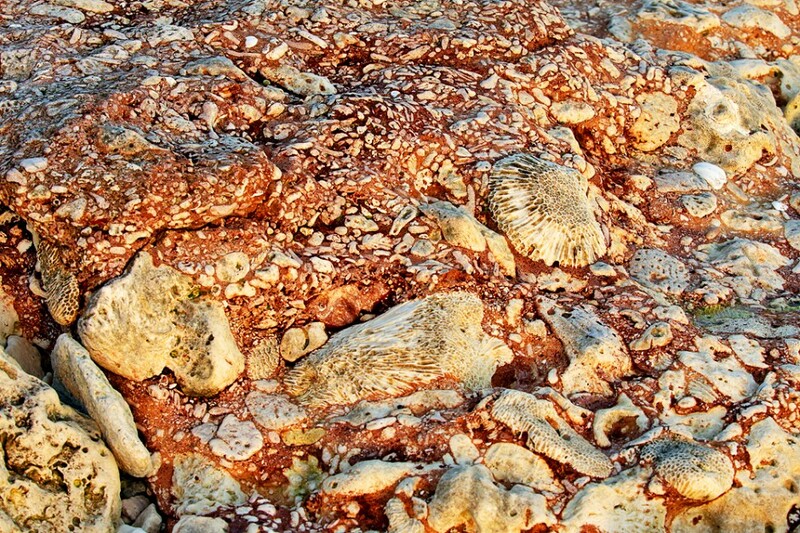 The beautiful beach rock shown here is like a conglomerate of reddish sediments cementing defined pieces of coral. It can be found around the high tide line on the southwest side of the island. The original lighthouse was built in 1873 using wrought-iron plates prefabricated in England and shipped out. These plates clad a wooden structure of timber framing brought from Brisbane. The lighthouse was manned until 1988, the light finally deactivated in 1995, coinciding with the activation of the new steel skeleton tower light. When I see decommissioned lighthouses I always feel a tinge of sadness -- the aesthetics of the new ones don’t even come close, and doubtless won’t last 140 years. I’m very glad to see they left the building, though, and enjoyed seeing it glow in the light after sundown. 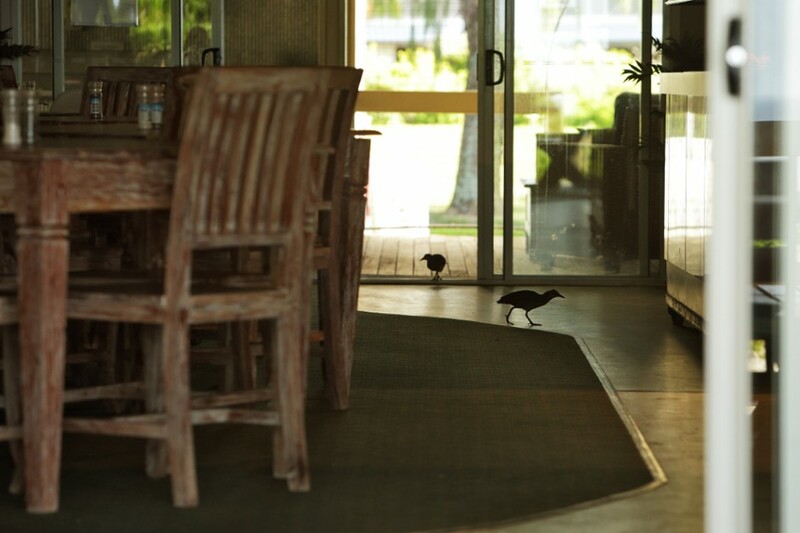 Incidentally, it was quite funny making my way back to my room on the other side of the island after taking this shot. It was almost pitch black, and as I passed each tree it would screech at me (thousands of noddies). 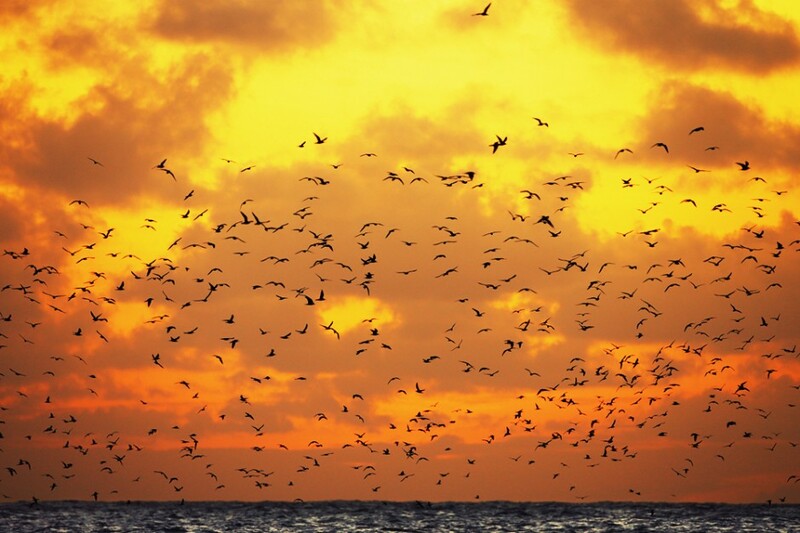 I simply couldn’t imagine what it would be like with 100,000 birds -- an ornithologist’s paradise certainly, but what about trying to sleep? Healthy coral in all shapes, sizes, and colours provides a sanctuary for all manner of weird and wonderful creatures. One of the things about being in a place like Lady Elliott is you don't want to miss a moment, so "early to bed, early to rise" is the mantra. 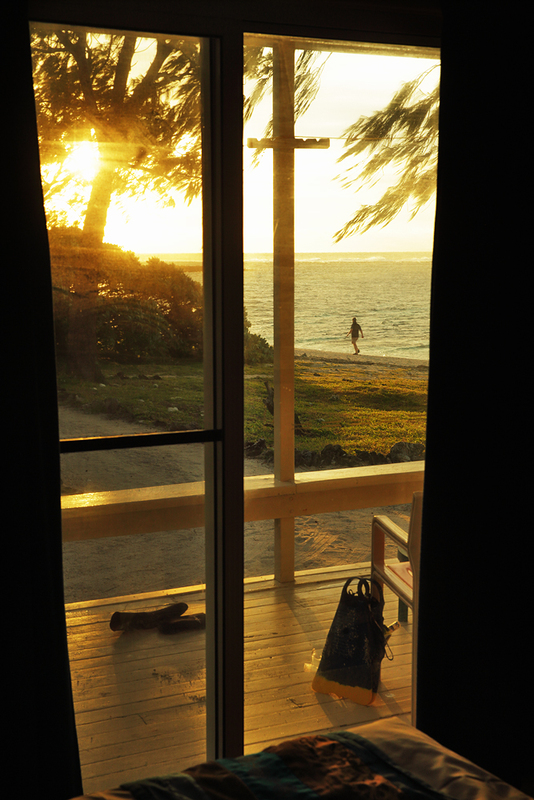 Waking to see a golden sunrise like this from your bed is one of the many benefits. If high tide coincides with a good sunset, you can go for a brief snorkel after the day's activities and be treated to scenes like this. This little chap sat stock still for hours, which, allied with the intense colour and wonderful texture, caused many a passerby to wonder whether it was real. Seemed to be very content -- you can tell from the smile. 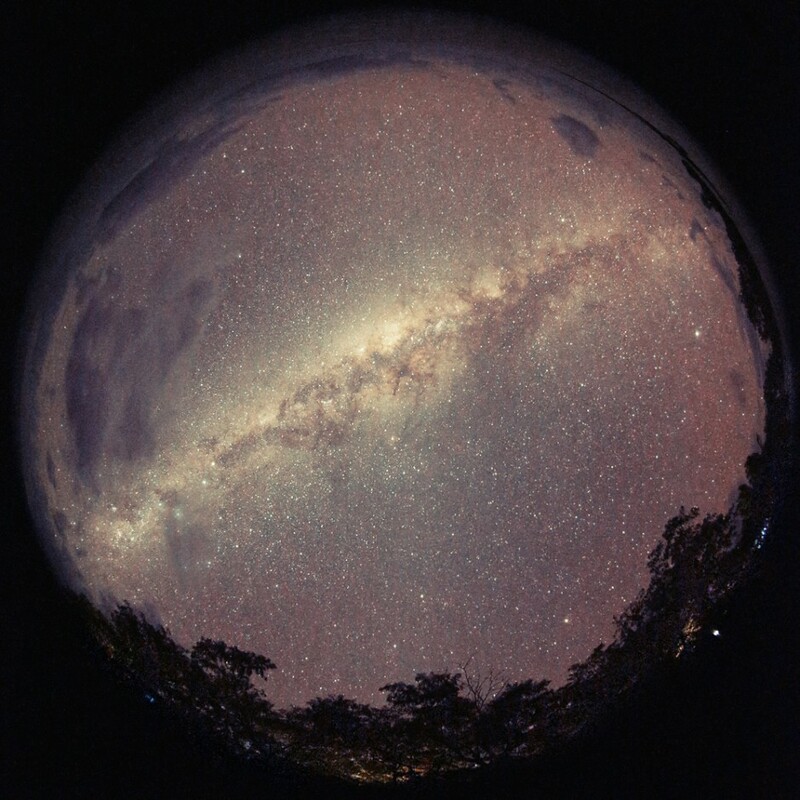 I've long regarded 180-degree fisheye as a gimmick, but then I never had the chance to do one until recently. I shot for some years on Canon full frame -- with the excellent 15mm/f2.8 fisheye -- which allowed for 180-degree diagonal fisheye. Going digital, I was then limited (with the digital bodies I had) to crop factors of 1.3 and 1.6. That was until Canon released the 8-15 fisheye, which allowed 180-degree diagonal coverage on cropped sensors and 180 horizontal (circular) on full frame. When I finally got a full frame sensor again a couple of months ago, I knew at some stage I'd have a go at a full circular fisheye. Arcing over Lady Elliott, the Milky Way presented the perfect subject to have some fun with -- and to test the ISO capabilities of the new camera body. These seastars are very common in the shallow waters surrounding the island, but their frequency made their deep velvety blue no less appealing. 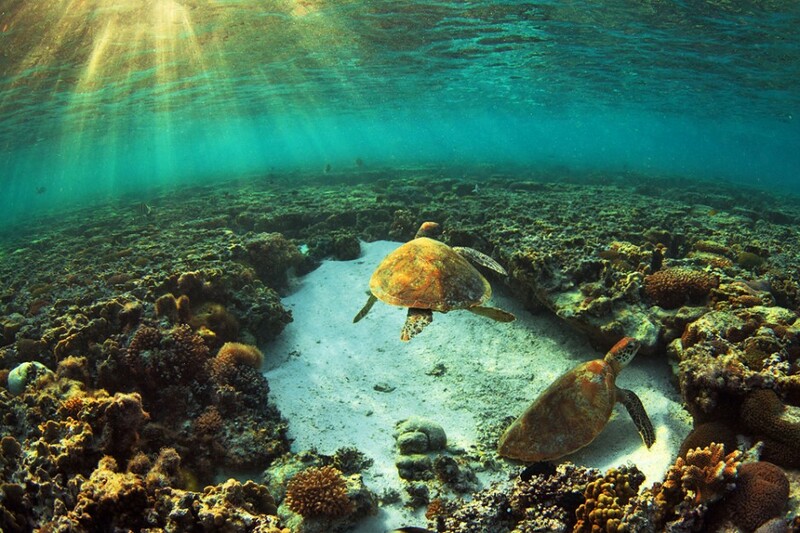 Both species call the island’s reefs home and lay their eggs on Lady Elliot’s beaches several times each year. The challenge for me was distinguishing which is which, particularly as none of the ones I saw had reached an age/size where it was obvious (the green turtle can grow to five feet, whereas the loggerhead can reach a mammoth seven). There are a couple of tips that can help with identification. 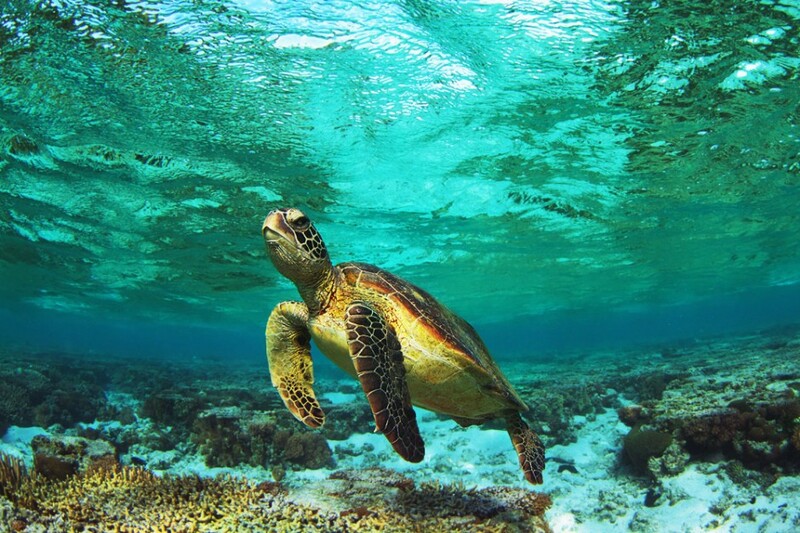 They involve differences in the number of prefrontal scutes (scales at the front, top of the turtle’s head), differences in the number of lateral scutes (large scales on the side of the carapace), and claws on the front flippers. The loggerhead has two on each fin, the green only one on each. This picture illustrates the difference beautifully -- one claw on each, which means it’s a green turtle. Having been baffled for some time as to how the green turtle got its name, as they always seem to be brownish, I learnt whilst researching this story that the name comes from a layer of green fat under their shells. Lady Elliot is one of the few places where it’s possible to see these beautiful birds in Australia, and if you go at the right time of year you’ll get the chance to see them nesting. This nest was under a bush about 30 yards from my room, and each morning I’d go and watch them. The chick was tucked away under the mother’s wing most of the time, but I finally got a shot of them both when the chick poked out for a brief look at its surroundings. On the last evening, brushstrokes of vibrant pink crossed the skies; it was a fitting goodbye. As I stood on the coral sand, a balmy breeze ruffling my t-shirt, I felt an incredible sense of gratitude and a strong desire not to leave. I decided I would have to return one day, and asking about rates before my flight the next morning I was delighted to hear that any return guests get a discount -- which, of course, only served to strengthen my resolve.